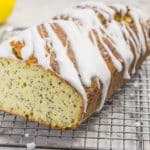 Keto Lemon Bread Loaf - "Poppy Seed" - Starbucks Style! We love sitting around at Starbucks yacking away or just taking a break so we thought we'd take some of their delicious food make a Keto Starbucks version of their Lemon Loaf. In a large bowl, add the almond flour, baking powder, sweetener and poppy seeds. Mix well. Add the lemon zest, lemon juice and butter and mix well. Add the eggs and mix until all combined. Pour the mixture into your lined 9x5 loaf tin. Bake in the oven for 45-50 minutes. The loaf is cooked when golden brown and springs back when touched. Add the icing mix and lemon juice to a small mixing bowl. Slowly add the water until the mixture has a pouring consistency. Drizzle over the cooled loaf, cut into 12 slices and enjoy!